4. Admission is $5 (But you get 5 FREE Raffle Tickets (Valued at $1 each) so basically you get in for FREE. Kids are FREE too. Having the Exact Amount Helps Things Go Smoother at the Entrance. Admission is $5 (Kids 16 and Under are Free). So you Pay $5 to get in but you get $5 in FREE Raffle Tickets. The Northwest Indiana Frag Swap (Portage, Indiana) is just 3 Weeks Away !!!!!!!! 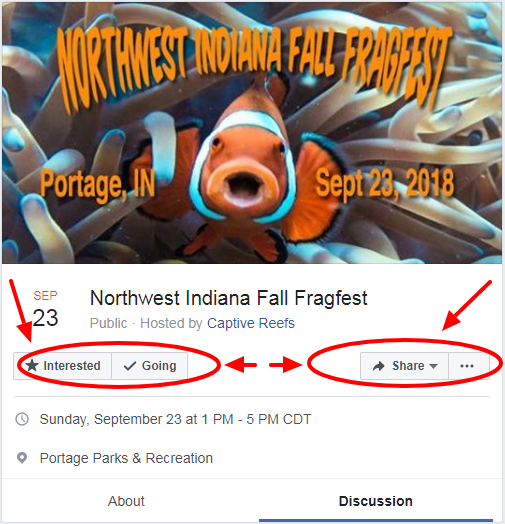 EVERYONE Please Remember to Mark "Going" or "Interested" on the Northwest Indiana Frag Swap (Portage, Indiana) Facebook Event Page. The Northwest Indiana Frag Swap (Portage, Indiana) is just 2 Weeks Away !!!!!!! !